Tall fescue is a cool season grass with the scientific name – Festuca arundinacea. Tall Fescue is a tough grass that can withstand lots of traffic and play. It can also withstand some diseases and has insect resistance. Tall Fescue is green all year and acts as a good transition grass from one zone to another. 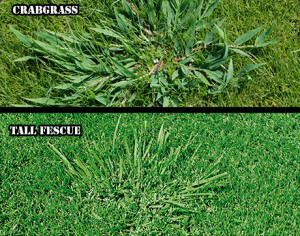 Many consumers will confuse if with crabgrass and visa versa. Crabgrass dies off in the fall after releasing seeds. You can tell the difference very quickly as crabgrass dies off. One of the disadvantages is that it tends to clump and will dominate other grasses. If this is a concern you may not want to use this particular grass type. Shade tolerance is good. It also has good drought tolerance as well with deep roots and a clumping style as mentioned. Fertilizer should be applied at a rate of .1 to .5 pounds per 1000 square feet during the growing season. This grass wears well in the spring and fall when it is growing quickly, however less so in the summer during dryer periods. Mow high at a level of 2 to 3 inches. It does well in cool seasons while also having he ability to tolerate heat conditions. He needs to find away to keep the dogs from urinating on his grass and also make sure it gets enough water. Perhaps a small fence of some kind. If it his grass is Kentucky 31 Tall Fescue it will not green up no matter what he does to it.